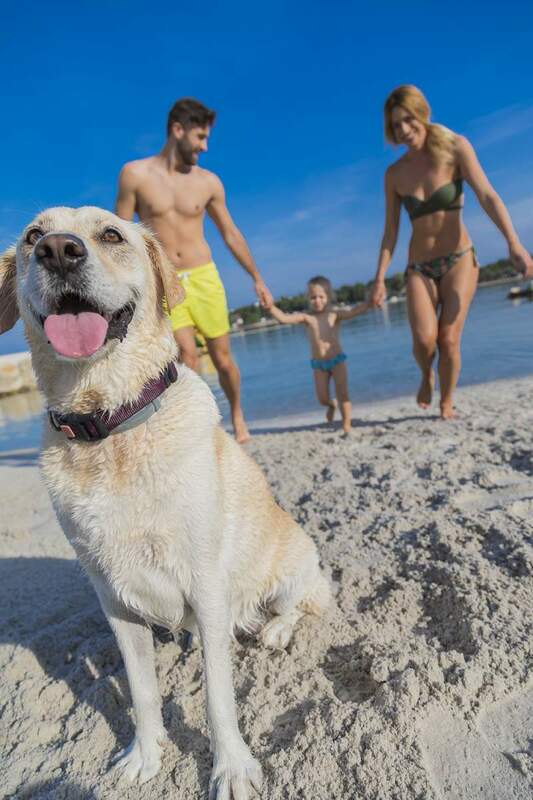 Are you planning a holiday in Poreč with your pet, but you're not sure where to stay, which bars and restaurants you can enter with your four-legged friend, and which beaches you can take him to for a swim? Whether you’re travelling with a dog, cat or hamster, you’ll find numerous hotels, apartments and campsites where pets are welcome. Many offer special benefits for pets, like houses and water bowls, and most are located near the sea or spacious meadows that are perfect for carefree sniffing and running. In addition to our numerous units of accommodation, your pets are more than welcome at 99% of the restaurants, bars and shops in Poreč. If you can’t enter one of them with your pet, most of them offer a suitable spot where they can wait out front while you do your shopping. Believe it or not, Poreč has a whopping 14 dog beaches where your pet can enjoy complete freedom. Most of these are located right near pet-friendly hotels, campsites and apartments. Poreč is an especially good place to stay with pets because of the many green areas and promenades, where both you and your pet can get some exercise. For the more advanced among you, Lanterna Premium Camping Resort even offers a special dog exercise area. In the case that you need special care for your four-legged friend, two veterinary clinics and the only veterinary hospital in all of Istria are right nearby. In addition to full medical treatment, vaccination, and emergency surgery and other interventions, the veterinary hospital also offers dog hotel services if you want to leave your pet in safe hands while you set off on an excursion. Within the veterinary facilities in Poreč, you will also find a pet shop and a specialised pharmacy, whose professional staff will offer you much-needed advice and recommendations if you have any doubts. But that's not all! For a truly special holiday, Poreč even offers wellness and grooming for your pet! They're on holiday too, after all! Treat yourself and your pet to a happy holiday. Visit Poreč! *Sniff through a detailed list of pet-friendly accommodation, beaches and veterinary centres for pets in Poreč.